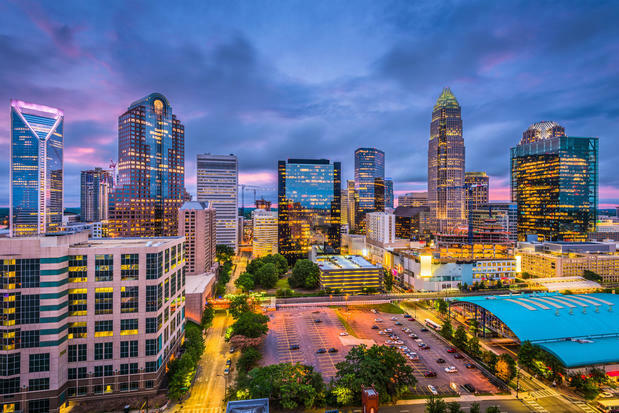 The UPS Store at 501 S College St in Charlotte can help make your conference or event at the Charlotte Convention Center easier. Ship all the items you'll need for your exhibition or meeting to us, then either pick them up when you arrive, or have us deliver them to your booth or meeting room. When your event is over, we'll handle getting everything shipped back to you. Arrange for us to pick up your items or just bring them into the store. We accept and ship packages via ALL carriers. Extended hours based on special events and upon request. The UPS Store at the Charlotte Convention Center handles packages and shipments from all carriers. Freight shipments: deliver to loading dock storage. Sunday: Open for special events. *Extended hours for certain events and upon request. Pick your packages up at our location or arrange to have us deliver them to your booth/meeting room for an additional fee. Consult center website for current hours. Call us for more information at 704.339.6036. Please bring all outbound packages to our center or arrange for us to pick them up (additional fee applied) from your booth or room. If packages need to be picked up or dropped off during irregular business hours please let us know in advance. We will do our best to accommodate. Packages will incur additional storage fees after four calendar days and the fee is based on the original storage pricing. We accept packages from all carriers and are able to ship via all carriers including freight. The UPS Store 6958 in the Charlotte Convention Center is proud that employee Nick Cruz is represents the store and our services working with the Charlotte Regional Visitors Authority (CRVA) and Visit Charlotte to help with customer service, business growth, packing, shipping, events, conventions, freight, and more for local businesses, residents, tourists, sports fans, bankers, and employees in Uptown Charlotte, North Carolina. Limit one coupon per customer. Not valid with other offers. Restrictions apply. Valid and redeemable only when presented at The UPS Store located at 501 S College St. The UPS Store centers are independently owned and operated. © 2018 The UPS Store, Inc. This privacy notice ("Notice") describes the practices related to information collected by the individual The UPS Store entity Csp Charlotte, LLC (referred to in this Notice as "Franchisee", "our", and "we") from visitors to this website ("Website"). This Notice only applies to information collected on our Website(s). This Notice does not describe the information collection practices of The UPS Store, Inc., United Parcel Service, Inc. ("UPS"), or any of its subsidiaries or affiliates, or any other The UPS Store franchisee. To the extent required by applicable law, California residents may ask us to provide them with (i) a list of certain categories of personal information that we have disclosed to third parties for their direct marketing purposes during the immediately preceding calendar year, and (ii) the identity of those third parties. To make this request, California residents may contact us as at store6958@theupsstore.com. Welcome to the website of The UPS Store Csp Charlotte, LLC, a The UPS Store center location independently owned and operated by Csp Charlotte, LLC. This Website is provided by, or on behalf of Csp Charlotte, LLC. This Website may be accessed from various locations both within and outside the United States of America (“USA”). Access to and use of the Website, including functionality and features and products and services available through the Website, may be inappropriate, prohibited or restricted in certain jurisdictions outside of the USA. In addition, certain functionality and features and products and services available through the Website may not be available in jurisdictions outside the USA. We make no representations or warranties that the Website is appropriate or available for use outside of the USA. If you access or use the Website from outside the USA, you do so at your own risk and are responsible for complying with the laws and regulations of the territory from which you access and use the Website. This is a general audience website and users of all ages are welcome to browse the Website. However, if you are under the age of legal majority to form a legally binding agreement under applicable law, you should not use any of the products or services offered on the Website, download any Materials or Software, or provide any information about yourself through the Website. The Website Privacy Notice for The UPS Store center Csp Charlotte, LLC posted on this Website governs the use and disclosure of personal information collected from or provided by you at the Website.